Some animals are more appealing as others. Every kids knows the Giant Panda because it looks so cute. Tigers and Lions are popular because they’re large predators and dolphins are cute because they’re playful. For me the Blue Whale always intregued me. The largest animal that ever lived on the planet, even larger than the dinosaurs. Due to excessive whaling their numbers have decimated, so chances to see them are not very big. When we returned from Moffen, a large whale was sighted. The first thing I saw was its footprint, the area of flat water that they leave behind when they dive. It was a really big footprint, but it was hard for me to compare. A few minutes later it surfaced again, a bit further away. A huge back, with only a tiny dorsal fin…. 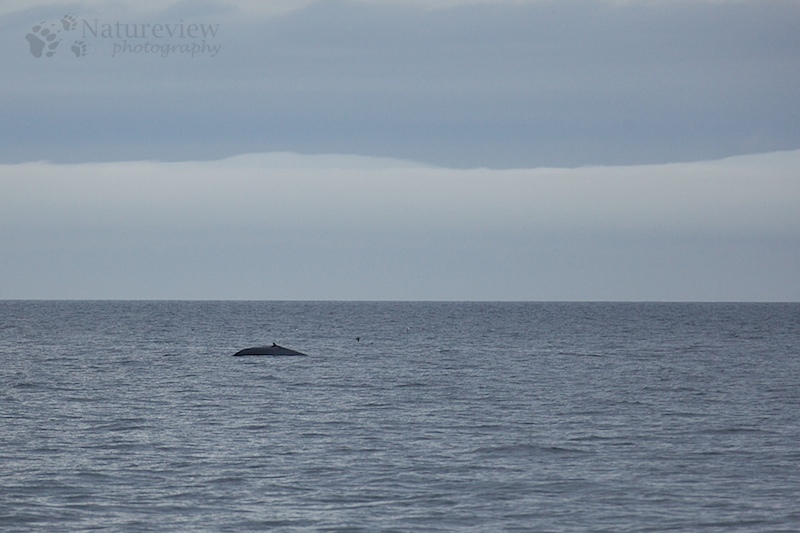 According to its size it should either be a Blue of a Fin Whale, the latter being much more common as the former. This made me initially ID the whale as a Fin Whale. The next day, when I was looking at my pictures again, and compared it to the Fin Whale pictures I took that day, The dorsal fin was definitely different, smaller and thinner. On pictures of others you could also see the whale had dark spots on its back, something that also matches Blue’s and doesn’t match Fins. And finally the behaviour, the whale regularly showed its fluke while diving, is also more typical for a Blue Whale. So after some initial hesitation, I finally got convinced that I had really seen a Blue Whale!! A childhood dream came true! The pictures aren’t that good, but I’m still very happy with the sighting. That’s pretty cool. I envy you!